Giant Red Rotala is a creeping or diffuse herb, rooting at lower nodes, branches ascending, and reddish stem. 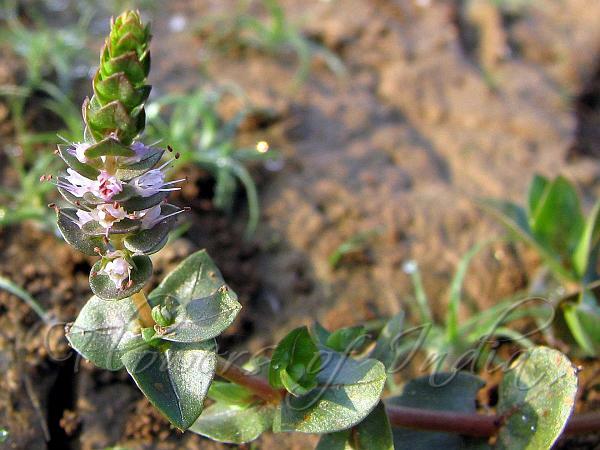 It is abundant in damp and marshy places. Oppositely arranged leaves are stalkless, ovate, tip blunt, base nearly heart-shaped. Small pinkish flowers occur in spike-like racemes, either at the end of branches or from leaf axil. Bracts large, leafy, in opposite pairs, closely arranged; bracteoles minute. Sepals 4, 2 mm long. Petals 4, free, attached to sepal tube, alternating with the sepals, less than 1 mm long; stigma thickened. In the West, Giant Red Rotala is popular as an aquarium plant. Flowering:January.